Located on 484 square miles within the Rocky Mountains, Grand Teton National Park drew 2,705,256 visitors in 2013, making it the eighth most-visited national park. 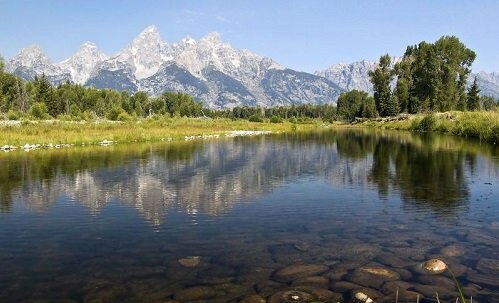 The original Grand Teton National Park was designated by then-President Calvin Coolidge in 1929. An adjacent parcel, Jackson Hole Monument, includes a 35,000-acre section donated by John D. Rockefeller Jr. in 1943. The two parcels were consolidated and designated as a single national park in 1950. Between September and May, many visitor centers within the park are closed; spring, summer and early fall are better times to visit.